Home » VectorVest » Buy Indivior (INDV) says VectorVest. The stock is very much in its ascendancy following market beating results. Buy Indivior (INDV) says VectorVest. The stock is very much in its ascendancy following market beating results. By Alan Green in VectorVest on 1st August 2017 . Indivior Plc (INDV.L) is a specialty pharmaceutical company. The Company’s Buprenorphine Business Group is focused on developing buprenorphine for the treatment of opioid dependence. It is engaged in discovering and developing medications and treatment for alcohol addiction, opioid overdose, cocaine intoxication and co-occurring conditions, such as schizophrenia. It is focused on providing therapeutic pipeline for the health epidemic of addiction and related mental health disorders. The Company markets and promotes SUBOXONE (buprenorphine and naloxone) Sublingual Film, SUBOXONE (buprenorphine and naloxone) Sublingual Tablet and SUBUTEX (buprenorphine) Sublingual Tablet. SUBOXONE (buprenorphine and naloxone) Sublingual Film (CIII) is prescription medicine indicated for treatment of opioid dependence. SUBUTEX (buprenorphine) Sublingual Tablet is for the chronic diseases of addiction, including opiate overdose, alcohol use disorders and cocaine intoxication. The VectorVest GRT (Earnings Growth Rate) metric flagged up the potential at INDV, both at the start of the year, when the shares were trading around 266p, and in the run up to the results announcement, when they traded at around 300p. Now at trading at 388p, INDV still has a forecasted GRT of 18%, which VectorVest considers to be very good, and something that is certainly borne out by the stated outlook for the full year. Added to this, the VST – (VST-Vector is the master indicator for ranking every stock in the VectorVest database) – logs INDV at 1.29, which is very good on a scale of 0.00 to 2.00. From a valuation standpoint, backed by the metrics outlined above, VectorVest has a current rating of 502p, even higher than brokers Numis and Jefferies, which both rate the stock as a buy with a 490p price target. 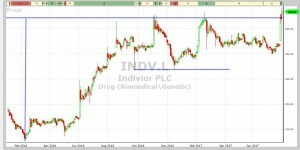 The chart of INDV.L is shown below where the price is in candlestick format over the past 18 months. After a period of strong trending behaviour the share has consolidated in a range for the past 12 months. The price ceiling of approximately 370 was rejected three times within the range and as expected by the technical community the share seems to have broken the range on the 4th attempt. Technically the previous range (as shown by the vertical line on the chart) should be repeated. This would result in a technical target similar to the VectorVest valuation at 502p. Summary: With a strong portfolio of speciality pharmaceuticals, it is clear from a fundamental standpoint that INDV is a share very much in its ascendancy. This view is also supported by the charting and technical picture, both of which offer ample support and justification for our 502p price target. The share is on a buy recommendation, but please note the share is not without risk as the VectorVest Relative Safety metric is less than 1. The opportunity is for those traders that can manage risk carefully and without hesitation. Readers can examine trading opportunities on ACA and a host of other similar stocks for a single payment of £5.95. This gives access to the VectorVest Risk Free 5-week trial, where members enjoy unlimited access to VectorVest UK & U.S., plus VectorVest University for on-demand strategies and training. Link here to view.